Well, it's Sunday and I have my first and only day off for this week! What a week it has been! I started off on this blogging adventure intending to post one up every day. After the first night, I soon realized that was not going to happen. Monday came and I knew nothing of trucking. The ONLY thing regarding trucking experience I had was backing up my 28' boat…big difference in 28' and 53'. We went through all the paperwork: applications, driver history reports, background checks, contract regarding my company's financing options, etc. Then we did the urinalysis and Work Well. I know before I came here I was concerned about the Work Well. Essentially it's just to make sure you can physically perform the job without keeling over from a heart attack - comprised of lifting various weights to and from various heights, all while monitoring heart rate. Word of advice: avoid caffeine and tobacco! I had just taken out some chew and my blood pressure registered what they labeled "Stage 2 Hypertension." Keep in mind…I'm 22! So if you are concerned in the slightest about how your blood pressure and/or heart rate will be…skip the coffee and cigarette! We started out the class with 10 people and we lost one woman to the Work Well. 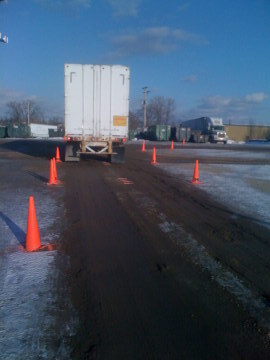 Tuesday we were spoon-fed at least 10 CDL practice tests. Keep in mind they only have three versions (maybe four) so we were taking them over and over and over. That's all we did all day. Wednesday we went to the DMV and took CDL exams. In my opinion, the company I am going to truck driving school with did this the smart way. Nobody focused on any endorsements. You can always add endorsements later. If you fail any test you will not be given your CDL, so we kept our attention on Class A, Combination, and Air Brakes. Then, once we pass all the other tests in the Driving Yard, we can get the cheat sheets. I was fortunate enough to have just renewed my Class C, so I did not have to take that test as well. I only missed one on the CDL exams. A few of my classmates did have to re-take Class C and failed the first time through. Eventually, everyone walked away with their permits. Thursday we did logs ALL day long. Even though my company does do electronic logs , it's a good thing to know just in case the system goes down. It's either - know paper logs, or don't drive until the system is up. They seem pretty easy to do. Friday we went to the yard and began being fed everything we needed to know for three different application tests: Air Brakes, In-Cab Inspection, and Pre-Trip inspections. Friday we focused on Air Brakes and In-Cab with SOME practice doing air brakes. All Day Saturday we did air brakes and were introduced to straight line backing. One of my classmates and myself (both having a history in boat-towing) picked up backing quickly and were actually allowed to join the class ahead of us for some alley-backing. We will be doing our DMV tests on Air Brakes, In-Cab, and Pre-Trip on Monday. I can't wait to just get it over with! If there is any advice I can give to anyone who may be looking into truck driving schools and companies that offer trucking school is, once you get in there, focus on what they are telling you and nothing more! So many people in my school try to put the cart ahead of the horse and do nothing more than confuse themselves. You need to realize that these schools specialize in passing students. Period. You will learn what you really need to know once you are with your trainer. Right now, your only goal is to get your permit and, eventually, your license. They know exactly what needs to be covered on certain days and what does not. Again, you will do nothing more than confuse yourself and possibly others. Also, doing a good read-through of your state's DMV handbook isn't a bad idea. Don't worry too much about it because, like I said, they will spoon-feed you what you need to know. But one or two good read-throughs won't do any harm. It really is easy…and so much fun! Good luck to all of you and stay safe!